Uniform clean-out. I hate to do this to them so early :) but the one thing I have learned is that uniform shorts/pants go fast in stores and if I wait until August I can never find the right size. I have load and loads of hand-me-downs, but pants usually don't make it far with the boys. We had a lot of laughs as Andrew tried to make some pants work-NO they are floods! I'd say, or they would fall right off of him. We are still going strong on our summer reading program-Andrew is flying through Harry Potter and Patrick and I are really liking these books he chose. It makes such a difference when kids can read what they like. It makes ALL the difference actually. All were excellent-we both really enjoyed them. I have always loved the light coming in our living room window in the morning-it seems so peaceful before everyone is up. 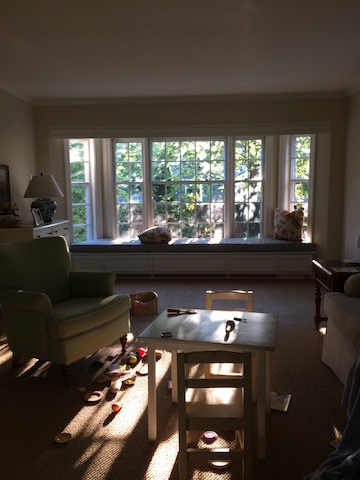 This room is never perfectly arranged (usually a basketball hoop in obstructing the view slightly) but the light is always beautiful. I'm so grateful for my lovely house-whenever I pull in the driveway I just feel that great feeling of "home-ahhhh". I hope my kids feel the same. They may not say it out loud, and may not even realize it for years, but I'm sure that they feel like that. You'll love hearing their stories of their childhood when they are fully grown. Most of the time, they'll share things you never realized they even noticed! I remember the uniform check! I always did it in July too. I love the picture of your room. That really expresses life. All too soon it will be in order and you will miss it!!! It is so important for kids to like what they read. I am a retired teacher. I never had problems getting kids to read once we figured out what they liked. They will read and grow and learn when they like it. I highly recommend the Henry Ford museum if you haven't been. Really interesting for all ages...parents too. 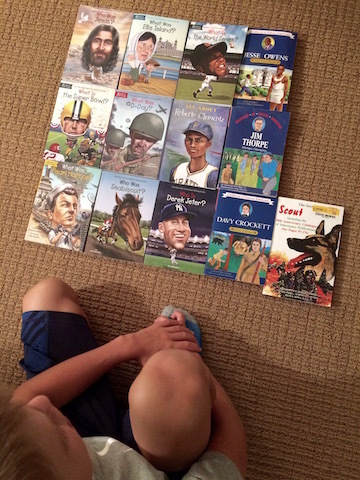 My son LOVED all of those Who Was/Is books. He borrowed I think 20 on one trip to the library. :) I read a few on my own too, haha. Sarah, like you I clean out and purge on a regular sometimes daily basis. Less is liberating! My 6 year old daughter, however, is holding onto every rock, toy, piece of paper, etc and I just can't find the words to help her understand less is more. 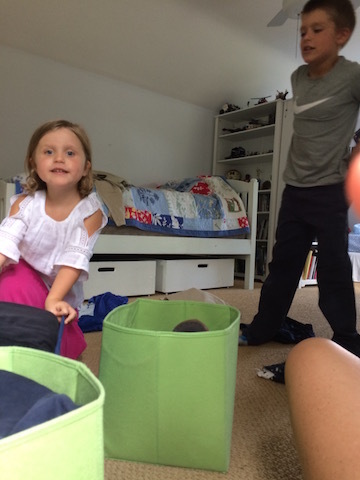 She will feel better if her room isn't crazy with piles everywhere. I don't want her to feel like I am taking charge of her space or it's a punishment to get rid of things. Any ideas? Hi Chelsea-A couple ideas-trust me I can totally relate-we tease Abbey because she used to keep little cereal boxes and wash out old cans etc. I'd open up her desk drawers and see the strangest things-the treasures were hilarious! We've used a little trunk or suitcase (personalized is cute!) to keep all her "treasures" in one place-the boys have these also. I also have a "scrapbook box" (large tupperware container) to keep things they just can't get rid because of special memories (and Abbey has five so far!!! up in the attic). Lots of school papers, and a few items of clothing, baby shoes, even an old cast...those types of things. This is a perfect compromise because it keeps all these things together and somewhat organized, but not spread out all over shelves, cluttering things up. I do think it's so important to keep their spaces somewhat organized and simple. Maybe if she picked out the special case she would be more willing to reorganize everything. I am very curious about the boxes under the bed - they seem to have rollers on them? Would you mind sharing where you found them? My sister in law is looking for the exact thing for her children's beds! Dana-I had my dad make those-they are plywood boxes with rollers screwed in underneath. They are awesome! I always think ahhh...when I read your blog! Thanks for always keeping it so real! UGH...uniform check...summer is flying by too quickly!!! Really interested in the "What was?" and "Who was?" books for my second grader. Is there a way to search for them other than by individual author name? They seem to be part of a series...could anyone suggest how I could ask my librarian if they carry them? Thanks in advance for the help.